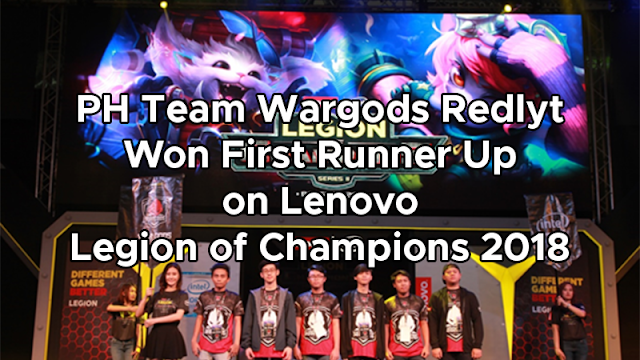 Lenovo’s Legion of Champions Series II Grand Finale after a grueling three-day competition that saw Asia Pacific’s best League of Legends players battle it out for supremacy last January 26 to 28, 2018 in Bangkok, Thailand. The team took home a cash prize of 100,000 THB or approximately PHP 164,000. Argma from Hong Kong was crowned as grand champion after defeating Wargods Redlyt in a fierce and highly entertaining akibat matchup. Meanwhile, Fire Dragon from Malaysia was declared second runner-up. “This was our first time competing outside the country and we are very and happy and humbled to represent the Philippines in a huge gaming event,” said Wilson Marañon of Wargods Redlyt. Wargods Redlyt won the right to represent the Philippines after besting 113 other teams through seven elimination rounds during the national qualifiers held last December. ​​“Reaching the finals was beyond our expectations. It was a tough competition. We still can’t believe that we reached that far,” added Marañon. Lenovo Legion gaming devices were used throughout the whole tournament, thus giving every team world-class experience in speed, performance, and consistency. Together with Intel, Legion of Champions Series II is one of Lenovo’s major efforts in nurturing the next-generation gamers and growing the gaming community in Asia. “All of the devices that we used provided high performance and really helped our game. We thank Lenovo for all the support that they have given us, and we hope that the Legion of Champions tournament will continue its success,” said Marañon. For a recap of the Legion of Champions Series II, watch Legion of Champions Series II Finals or see the highlights of the 3-day Legion of Champions Series II.